Felix Junior is an Abuja based gospel music minister set out in 2018 with what can be described as “a gathering of desperate people to be blessed & be refreshed in the spirit”. 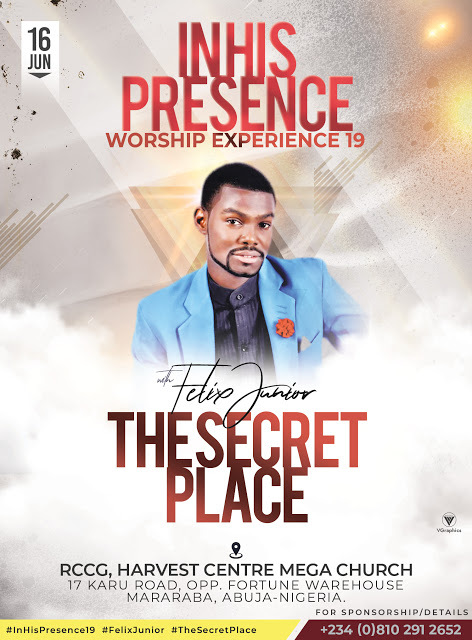 Following the huge success with the 2018 edition of IN HIS PRESENCE WORSHIP EXPERIENCE, Felix Junior has tipped of that the phenomenon event will be an evening of worship Encounter for the spirit, soul & body while advocating that attendants will experience God in a new dimension. This epic event will be having the likes of Abuja based gospel music ministers and many more that will be unveiled soon. Venue: RCCG, Harvest Centre Mega Church Road, 17 Karu Road, Opp Fortune WareHouse Mararaba, Nassarawa State.